Successful completion of this course provides a 10% reduction, for 3 years, in the base rate of the motorist's current automobile liability, no-fault and collision premiums and a 4 point reduction on a New York motor vehicle record. Click on the link at the bottom of the page to get started online today or call for classroom times and locations in New York State. I DRIVE SAFELY is your solution! After completing our one day training program, you can become a licensed defensive driving instructor with an industry leader. I DRIVE SAFELY will provide you with everything you need to maximize your profit and grow a successful business in the defensive driving industry. I DRIVE SAFELY offers both a traditional classroom curriculum and an approved online course for you to link to. 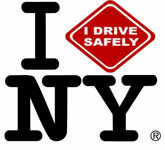 If you do not have your own web site, I DRIVE SAFELY will provide you with a link when you sign up. Why wait another day? Stop paying high sponsor fees and start making MORE money today with the I DRIVE SAFELY defensive driving courses.